There was a time in which my entire living room was furnished by craigslist, the online classifieds site where you can find everything from furnishings to jobs to that special someone who happened to catch your eye on the subway the other morning. Craigsphone from Next Mobile Web promises to deliver that service to your iPhone or iPod touch, with a mobile interface for the popular online classifieds service. 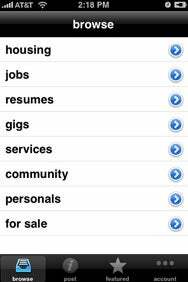 An update to craigsphone after its initial release added the ability to browse listings by subcategory. This isn’t the first time Next Mobile Web has built an iPhone interface for a popular online service. The developer also has apps that let you browse Wikipedia and manage your Netflix queue. In the case of craigslist, the company’s craigsphone app lets you browse and post listings, including the ability to upload photos and share your location. Craigsphone remembers recently viewed postings and features clickable phone numbers to initiate calls directly from listings. The app also boasts a Nearby feature that lets you browse for postings in your vicinity, though the Next Mobile Web information page says that feature currently works in just the San Francisco Bay Area and Manhattan. Since going live over the weekend, craigsphone has undergone several updates, such an improved filter that lets personals ads be included, an improved interface for browsing and searching, and the addition of sub-category browsing by clicking on the blue detail button. The free app runs on any iPhone or iPod touch using the iPhone 2.1 software update.